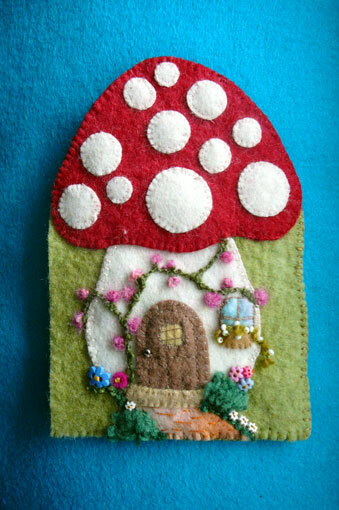 All this focus on winter and creating gnomish lanterns led to this cosy, little home appearing after a search in the felt box . I had been trying to find that right green for the nasturtium leaves of Summer’s Child. As I unfolded this leafy, green remnant out fell the bits of this wee home. A while back I had experimented with some white spots that were cut- outs from various projects by placing them onto a free cut piece of red and noticing that it had begun to resemble a toadstool cap. There were even a couple of these dots that were stitched down. As happens other things cropped up and time passed, so there it lay, forgotten. It was in that state “what next” and waffling indecision that this discovery was made and I was very happy to find a new project already commenced . When completed the toadstool home needed a garden, and then a function. It has now become another needle case as well as a gift for my sister. The back cover has a pocket inside for a needle threader and the front cover one for packet needles. As the cap of the mushroom is reasonably thick it could aslo serve as a pincushion. Functional with beauty, imagination and nature inspired Isn’t it amazing how something so small and simple can capture this essence? Gorgeous Christina, your work is an inspiration. I have been going thru my felt as I need a little case for my scissors….thats as far as I have got though. Maybe I should rectify that! Hope you are well, I have been a terribly slack correspondent. Such a charming wee cottage-love it.